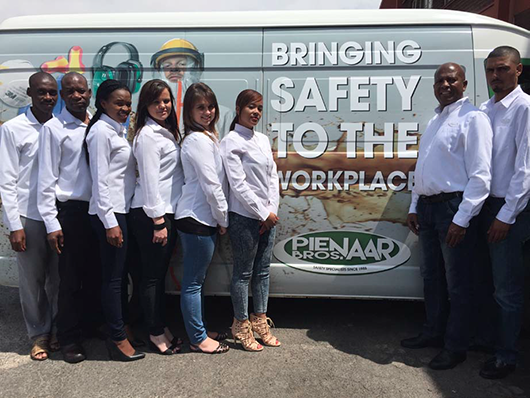 As a company, Pienaar Bros has been trading for more than 50 years and is today one of the largest distributors of personal protective equipment in Southern Africa. We have numerous branches and on-site stores strategically positioned to offer a broad range of products and services across South Africa, Botswana and Mozambique. We strive for excellence in price, quality and service and by using our buying power and relationships with suppliers (local and international) we are able to negotiate the best quality and prices on personal protection equipment. With stock in excess of R80 million, and a staff complement that is experienced, trained and motivated, we can see to the varied requirements of our approximately 3 000 customers reliably and expeditiously. Our business is aimed at providing as broad a range as possible of personal protective equipment and supplementary products to our customers, but always focussed on superior quality products offering value for money. We’re always on the look-out for world class-products and suppliers to complement our range, which in turn, gives our customers access to these products. In addition to having a wide product range, we’ve tried to position our branches as widely as possible to offer a single solution to those customers who have a broad geographical footprint. This being the case, our Northern footprint extends to 18 branches and a number of additional on-site stores, giving us coverage across Southern Africa. Whilst today a sizeable operation, the business still has the heart of a family business, and is therefore flexible and intuitive to the needs of its customers. Our passionate and knowledgeable sales staff have a wealth of experience and are able to ensure the correct solution is found for any application. In addition, our supply partners offer expertise that is product and situation-specific so as to ensure the provision of a complete protection solution. Our management team has consistently applied the ‘Bringing safety to the workplace’ mantra in broadening our basket of quality products through an increasingly growing and convenient Southern African branch network. Today, we are an expanding business and a leading supplier of personal protective equipment within Southern Africa. We have a staff complement that is hardworking, honest, experienced, knowledgeable and dedicated to assisting our customers in providing solutions that are simple, necessary and practical. The success of the business has been built on the strength of our management and staff, and to this end, we continue to look for self-motivated people who will take on the Pienaar Bros’ ethos of being there for our customers, and who will have our customers’ best interests at heart.